The main floor of the O’Neill Library, known as Level Three, has undergone changes in the last year. A center for printing, copying, and scanning was created, with a service desk staffed by students who provide technical assistance. Adjacent to the circulation desk, the former reserves room has been expanded by roughly a third and turned into the O’Neill Reading Room, an open space for individual and group study. (Reserved materials have moved to the main circulation desk.) Along one wall of the new reading room, display cases exhibit rare books and artifacts from the Burns Library. The rest of the space is given over to what University Librarian Tom Wall calls “a mixed landscape”—traditional long wooden tables, upholstered chairs, and booths—that can accommodate approximately 125 people. 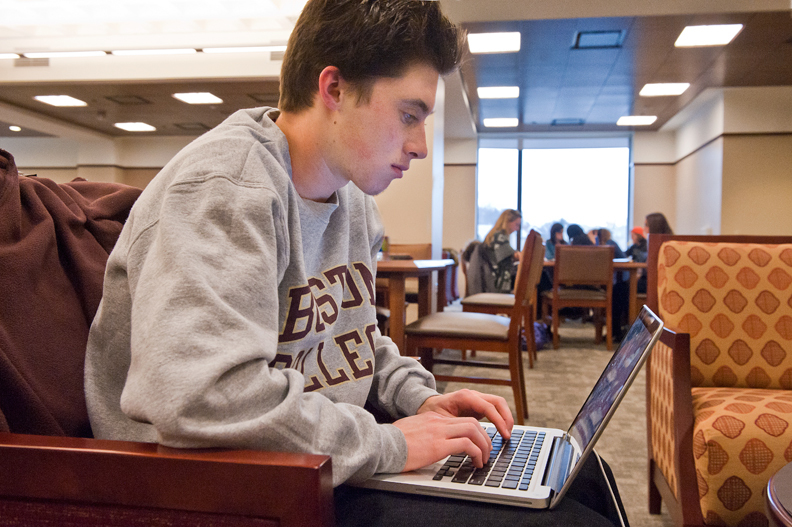 On February 2 (above), Louis Serafini ’13 was ensconced in the new O’Neill Reading Room. This feature was posted on Thursday, February 16, 2012 and is filed under Featured Photo.